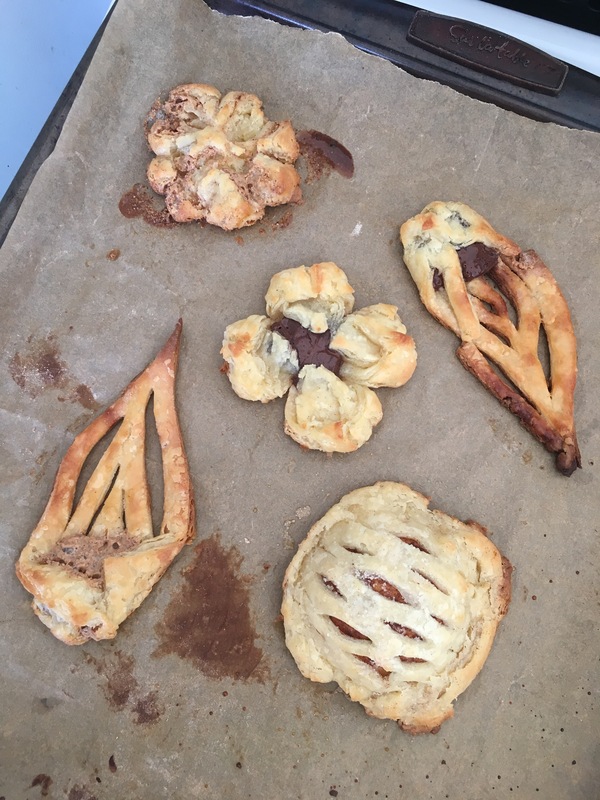 I have never made anything with GF flour and yeast… maybe should have started with biscuits? 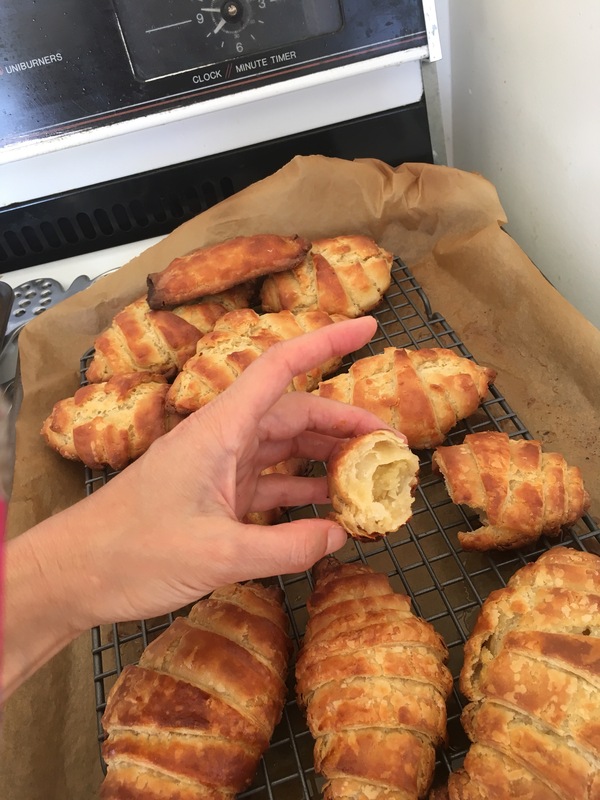 “Gluten Free Croissant” is considered by many to be an oxymoron… in fact, the whole impetus for this fools errand began because a friend thought it was laughable that I thought I could make anything with gf puff pastry, and I got offended – and determined! Anyway, following this recipe from Better Batter perhaps a bit more closely than usual, we have arrived! Not sure if you’re supposed to stir this… the yeast that was close to the water puffed up nicely, but the yeast on top stayed pretty dry, and the sugar didn’t totally dissolve in the water so there was a gritty syrup at the bottom. Step 2: Mix 2 sticks butter+3/4c sour cream+3/4c ricotta+1egg until it’s kind of like cottage cheese. Then mix in the yeast mixture. Not having a mixer, I used my immersion blender, and then a fork. I think this worked pretty well! Used my hand for this. It was very sticky. Also fun. Step 4: Divide in half, place each half in a ziploc bag and shape into a ~4×6″ rectangle. Refrigerate 2hrs-overnight. They seem to think you can shape the dough into rectangles first and then put it in the bags, but it was just a goopy mess. Step 5: Grate 2 sticks of frozen butter and refreeze them. Yes that’s right, this recipe ends up using 4 whole sticks of butter (and I actually added a couple extra tablespoons in the end because I didn’t divide it properly when making the puff…) the result came out too buttery for my taste, so many it’d be better with less? Step 6: Roll out one of the rectangles on heavily floured parchment paper to ~27×15″. Put 2tbsp of the frozen butter in the middle third, fold up the bottom and put another 2tbsp on top of it, and then fold down the top (so there are three layers with butter between each). I used too much butter in this step. Also the little butter shavings melt and become impossible to work with, so keep them in the freezer while you’re rolling out. Step 9: Cut the dough into super long triangles, 4″ at one end, and then roll them from the wide end to the point. Use egg white to stick the point to the body, and then brush the whole top with egg white and place on parchment paper on a baking sheet. I put chocolate into a couple of these at the wide end, but it didn’t seep out so I have no idea which ones are the chocolate ones. I took all the scraps and smushed them into a rectangle that I filled with a little chocolate and made into a pop tart-looking thing. That seemed to come out all right. Step 10: Let sit for ~30 min in a warm place (like on top of the preheating oven that this time is related to the croissants) and then bake at 415* for ~15-20 min. Step 11: Repeat steps 6-8 with the second rectangle, but instead of just making croissants, try other fun things you’ve seen people do with puff pastry, like this video I’m obsessed with, because when are you ever going to make puff pastry again, and how cool are these? I didn’t have any fruit or jam or chocolate spread, so I used chocolate squares and almond butter. I also didn’t put more butter on the apple cage because there is enough butter already in this situation, and also we don’t have any left. ← Grain-free Crepes: 6-way Taste Test!